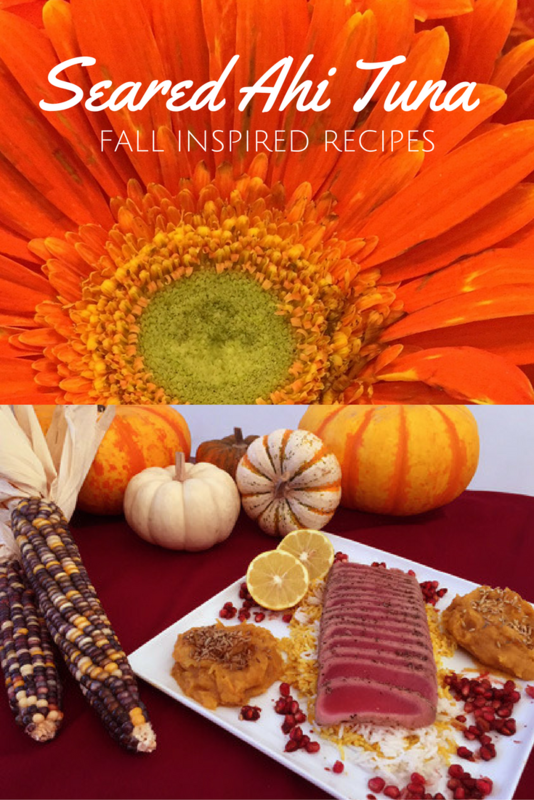 This post celebrates everything I love about fall. Beautiful fall leaves, cooler days, longer evenings, Indian corn, pomegranates, pumpkins and all the wonderful and varied kinds of seasonal squashes now available at the farmer's market. 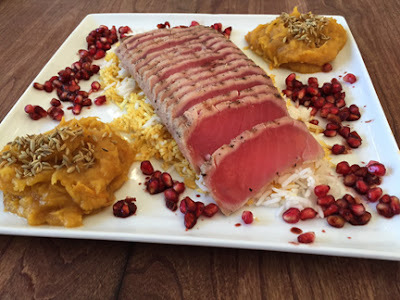 Still dreaming of Chef Jacque Pepin's exquisite Ahi Tuna medium rare entree I enjoyed on the Baltic Sea aboard Oceania Cruises this summer, I created my own menu built around Bumble Bee SuperFresh Ahi Tuna with Garlic-Peppercorn Rub. The results were absolutely delicious. In fact, this Bumble Bee product tasted fresh and was as good as the ahi tuna we savored on the ship. It was hard to believe that I found this in the freezer section at my local supermarket and that it came seared and rare, ready for me to serve. That freed me up to spend my time instead on preparing some fabulous side dishes incorporating seasonal fresh produce to go along with it. Read on for the recipes and directions to easily make this gourmet menu at home. This elegant and delicious fall menu, with Bumble Bee SuperFresh Seared Ahi Tuna as its centerpiece, is simple to make. Depending on whether you serve this as an appetizer or main course and how much everyone loves this, it serves 2-4 people. You'll first prepare each of the menu's elements, following the simple recipes below. After everything is ready, follow the step-by-step plating directions at the bottom of this post. 1. Keep frozen until ready to thaw and serve. 2. Remove fish from vacuum pack and place on a plate in refrigerator to thaw. 3. Thaw for about 3 hours. 1. 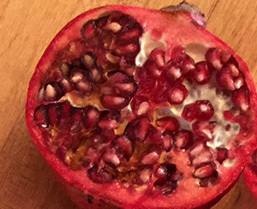 Using a sharp knife cut the pomegranate in half. Use one half for this meal and save the other for another purpose. 2. Remove the seeds, separating from the pulp. 3. Place seeds in a bowl, add pomegranate molasses and gently toss. 4. Set aside to garnish dish later. 1. 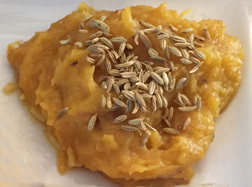 Cut squash in half, scooping out seeds to create a cavity. 2. To the cavity of each piece of squash, add half the margarine/butter, brown sugar and cinnamon, plus salt and pepper to taste. 3. Bake in oven at 400 degrees, 45 minutes to 1 hour, until tender when tested with a fork. 4. When squash is cool enough to handle, gently scoop out the flesh and discard skin. 5. Transfer squash to blender or food processor and puree. Add 1/4 to 1/2 cup water to replace water lost during roasting to the puree to achieve the consistency desired. 1. Place rice, salt and water in uncovered pot and bring to boil over medium high heat, boiling about 2 to 3 minutes. 2. When most of water has been absorbed and craters form, remove from heat. Cover and let stand at least 40 minutes. 3. Take half of the cooked rice and place in small mixing bowl, add the turmeric and the freshly squeezed juice of a half lemon and gently toss until well blended. Save the other lemon half for garnishing during plating. 4. Leave the rest of the rice plain in the pot. 5. Set both rices aside. This is the fun part, where you become the chef, an artist arranging food beautifully. You can either serve this entire menu from a single platter or smaller plates for individual servings. And don't worry the presentation will look great whether you use a square platter like I did or you choose to plate with a circular dish. 1. 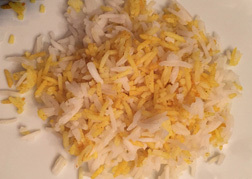 Down the center of the plate, spoon a generous amount of white rice onto the plate/platter, follow with a second layer adding the turmeric lemon rice on top. 2. Spoon two generous heaps of the squash puree on opposite sides of the plate. Sprinkle each squash heap with fennel seeds. 3. Sprinkle the pomegranate seeds around the perimeter of the plate, except on top of either the rice or squash. 4. Place the thawed, pre-sliced and arranged Bumble Bee SuperFresh Seared Ahi Tuna straight out of the package onto the top of the rice. Don't try to separate it. 5. Add a half lemon to the platter near the edge on one side or if you're using plates add a lemon slice to each. 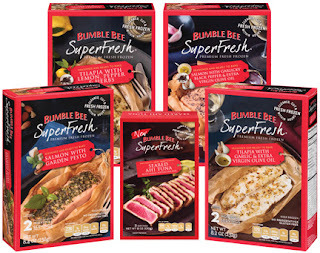 Bumble Bee SuperFresh Seared Ahi Tuna is the first time sushi quality “thaw and serve” packaged seafood products have ever been available at the supermarket. It stays frozen the entire time, even during processing and preparation, and is never fully defrosted. That's how the brand can guarantee the same quality, freshness and taste you'd expect from a fine chef cooking in the best restaurants. You can serve this great tasting fish simply with a side of soy sauce and wasabi, add it to a classic Nicoise Salad or serve it as the entree with some equally elaborate side dishes as I have. Bumble Bee SuperFresh is a complete new line of naturally-seasoned, restaurant quality, seafood solutions for the home cook. Each of the five offerings is quick, easy and delicious to serve. These include: Seared Ahi Tuna with Garlic-Peppercorn Rub; Tilapia with Lemon, Pepper & Herbs; Tilapia with Garlic & Extra Virgin Oil; Salmon with Garlicky Black Pepper & Extra Virgin Oil; and Salmon with Garden Pesto. The pre-seasoned Salmon and Tilapia come with their own parchment paper baking pouch and go from freezer to table in 25 minutes or less. All fish varieties remain frozen from when they're brought in on the fishermens' boats until you defrost them immediately before home preparation and serving. This is a sponsored post for Bumble Bee SuperFresh and I was selected for this opportunity as a member of Clever Girls and the content and opinions expressed here are all my own. FTC Disclosure: See complete FTC Disclosure information that appears at the bottom of MommyBlogExpert's home page and at the bottom of every individual post on this blog, including this one. I am not a huge seafood fan but my husband is. He would love this meal so much. 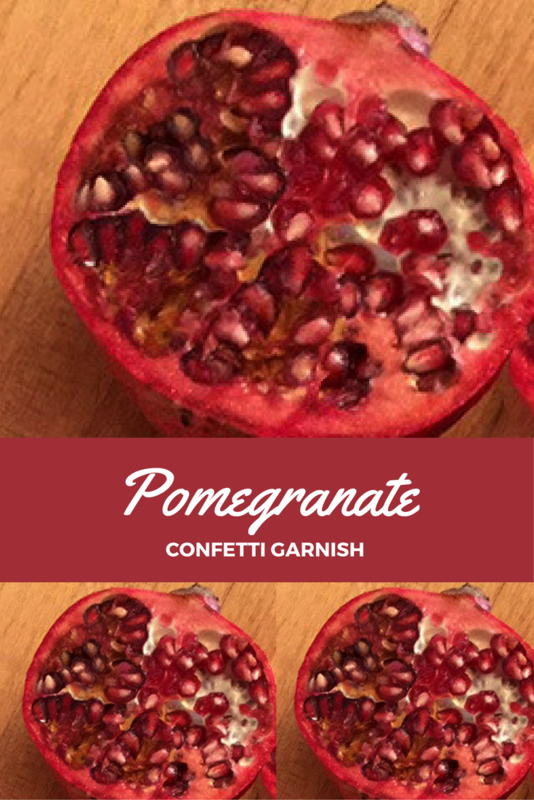 I love the pomegranate confetti! Pomegranate Confetti sounds awesome! Everyone in our family has a fever right now, so we could use this with the anti-oxidants and vitamin C.
This meal looks so bright and colorful! I'm a big fan of pomegranate too. 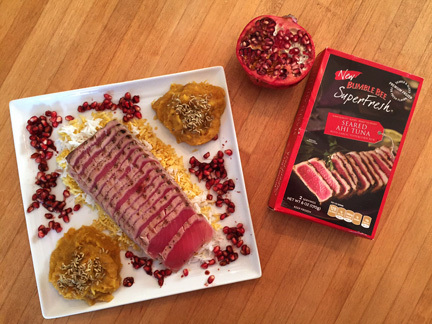 I had never heard of the Bumble Bee SuperFresh Seared Ahi Tuna with Garlic-Peppercorn Rub but it looks great. I like the edible garnishes you served it with for fun flavor contrasts. These all look super delicious!! Thanks for recipe ideas! I never thought to do seafood at Thanksgiving. It does make for a very colorful spread! I didn't realize Bumble Bee had frozen products like this!! Sounds like a great way to have fish on hand more often. The Bumble Bee SuperFresh Seared Ahi Tuna sounds delicious for my husband. He would love this! I have a good idea. You make that and bring it over to my house ;) It looks awesome. What a spread! I had no idea the Bumble Bee had anything except canned tuna. I love it! I thought that only Bumble Bee did canned tuna! I am not a fish person, but my friends LOVE it. I will have to tell them about this post. Wow! 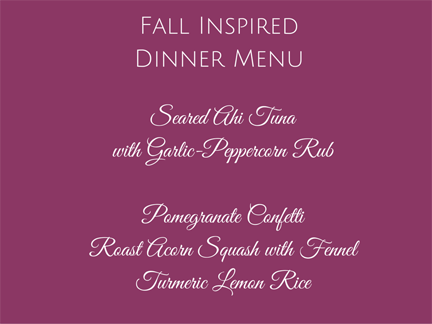 What a great fall menu. I have never made seared tuna at home. What a beautiful presentation. It all looks so delicious. I wish we had a better selection of seafood where I live. Wow! That looks great and not your typical Thanksgiving. My husband would love it! Wow this is gorgeous. I love the idea and a spin on what to offer on the plate. Yum! 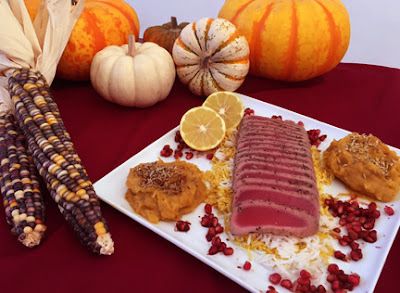 I didn't know Bumble Bee Seared Ahi Tuna existed- this is wonderful! I always want to serve seafood options when I entertain but have no idea how to prepare them! I have never tried Seared Ahi Tuna with Garlic-Peppercorn Rub before. It sounds so delicious. I will have to look for it at the grocery store on my next trip. My family loves fish. Seared Ahi Tuna looks so delicious. I can not believe you found this at your grocery store. I am excited to pick some up to try. Oh my gosh that tuna looks great with those sides. I would love to make a surprise meal like this. That looks so delicious. 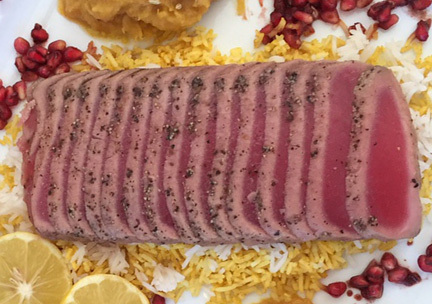 I love tuna, but I haven't tried doing this at home. I will look for this. I love to be creative with seafood! It can really create some amazing dishes! It was only last week that I ate my first ever pomegranate!! I bet this dish was very tasty! That looks so good! I know my husband would love it. That tuna looks perfectly cooked. Great job! I love a surprise meal. My husband is obsessed with ahi tuna, and I try to serve it when I Can. I need to learn how to pair it with other dishes! How beautiful! And I'm sure it tastes as good as it looks! The whole menu looks absolutely delish. I need to see if we carry Bumble Bee products in Canada. Oh wow! That definitely makes a great centerpiece. And it also looks super yummy! My husband would love this. I don't eat fish so I don't cook it either. I'm going to try to find him some. That looks awesome and I am not even a fish fan! You did a great job on that! I haven't seen this product yet from Bumble Bee. Will have to look for it. This looks sooooo healthy and delicious. I am not a big fan of raw but I would totally try this. I love ahi tuna!! Not a fan of anything from the ocean but totally want to try the Roast Acorn Squash with Fennel. Thanks for sharing these recipes. I will have to pick up some Bumble Bee SuperFresh Seared Ahi Tuna. It looks so delicious and is so easy to prepare. These look like delicious options. I will have to look for it the next time I go shopping. I saw some pomegranates today and thought they looked beautiful. Now I am sorry I did not buy any.